The GAMES section is where everything is put together. With over 85 games, containing time restrictions in one way or another, playing them helps you to quickly enhance knowledge of mental math while making the learning process fun. 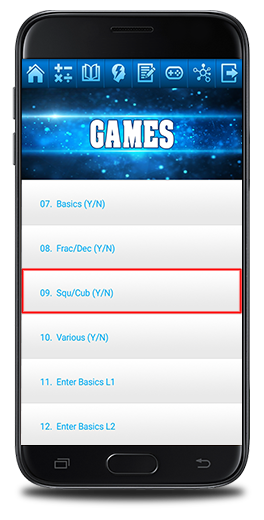 Furthermore, the games are based on finding the correct answers or parts of answers, and included are sixteen games with a duel or two player format, meaning two users can play against each other. Lastly, the games fall in one of these three formats: (i) 4 Multiple Choices, (ii) Yes/No, and (iii) Input. These examples have the 4 Multiple Choices format. The COMBOS part is selected from the GAMES section. The games in the COMBOS contain more than one math subject and involves several to many problems reflecting different techniques. A game involving FRACTIONS is selected in this GAMES section. Level 1 of this game means only single digit numerators and denominators are used. As mentioned the games in the COMBOS have more than one math subjects. 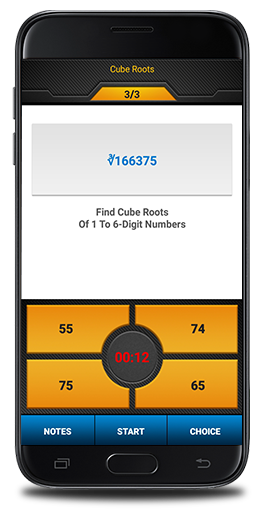 Here, play and select the correct answers for squaring and cubing numbers as well as finding their square and cube roots. 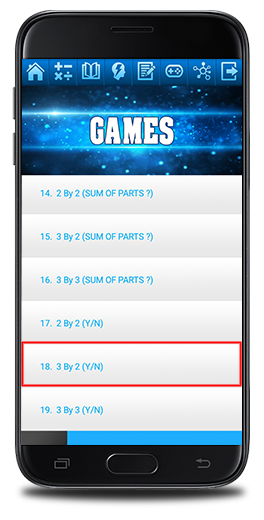 Press the NOTES button for more information regarding how the game is played and scored. The game here involves four math subjects and various techniques are needed for squaring and cubing numbers, and finding the squares and cube roots of numbers. As stated press the NOTES button for more information regarding how the game is played and scored. The objective is to get as many correct answers as possible before time runs down to zero. 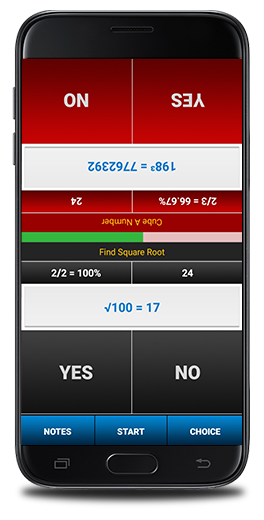 The number of correct answers and total attempts are also provided. 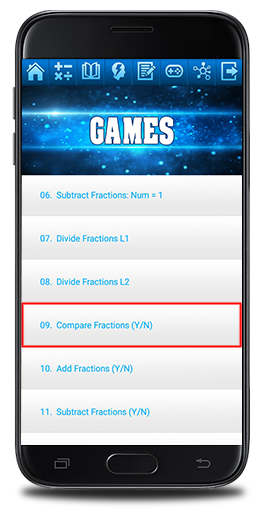 Completing the MATH SUBJECTS, LEARNING, TRAINING, and EXERCISES sections before playing the math games will surely help you with these games. Time and accuracy are the essence in these types of games. Now onto some game samples from the Y/N format. Take note there are two different Y/N formats in this app. 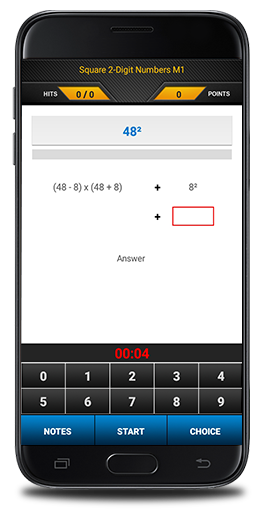 With this format two different time restrictions, 30 and 60 seconds, are available to choose from, including the number of correct answers and total attempts. Finally, at the end of the game the program creates a report which shows the number of correct answers, total number of attempts, the percentage of correct answers to total attempts along with an achievement level ranging from earning a Lollipop to a Gold level of competence. An addition game is selected from the GAMES section in this sample. This program is for adding three to two digit numbers together by applying smaller manageable parts for solving for the answers. Here, a game on fractions is selected from the GAMES section. This game involves comparing two fractions to see if the first fraction is less, greater, or equal to the second. This game contains various multiplication problems. Skills from multiplying by 5, 11, 50, 75, 125, 999, and so forth are required for solving these problems. The program begins when you press either the 30 or 60 seconds button. If you decide to switch the time, all other values are reset back to zero. Lastly, you can press the REPORT button to see your achievement level at the end of the game. The objective is to get as many correct answers as possible for the time restriction chosen. The percentage serves as the best indication of how successful you are. In many cases, use the cross multiplication technique to get the answers. The program automatically generates a new math problem after you have selected Y or N with other values produced reflecting the choice made. A beep sound is activated anytime when there is an incorrect answer. The following samples are from the second format of the Y/N games. Only one time restriction is available in this format and the timer counts upwards instead of down as in the first format. The objective in these Y/N games is to get 10 correct answers as fast as possible with the best percentage dependent on the number of correct answers to the total number of attempts. 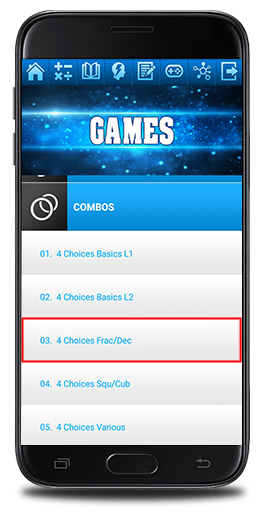 These three samples are taken from the COMBOS part of the GAMES section of the app. Each game in the COMBOS involves more than one math subject. This game here contains four math subjects and it is on squaring and cubing numbers and finding the square and cube roots of numbers. For this game, various math subjects are included from basic math to converting fractions into decimal numbers. Since this is the BASICS game it includes basic math subjects as addition, subtraction, multiplication, and division. For the division math problems, the answers are in a quotient and remainder format if there is a remainder as shown in this example. Instead of the timer counting down, the timer for these types of Y/N as mentioned above counts upwards in one second increments. 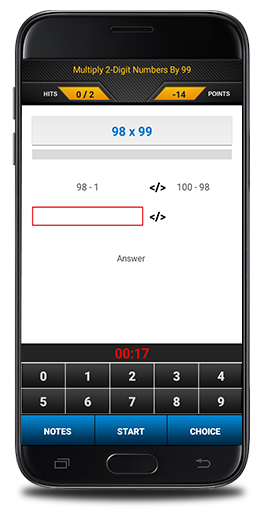 The goal is to get 10 correct answers as fast as possible. The program is stopped when 10 correct answers have been achieved. Press the NOTES button for more information. These types of games also show the number of correct answers and total number of attempts. 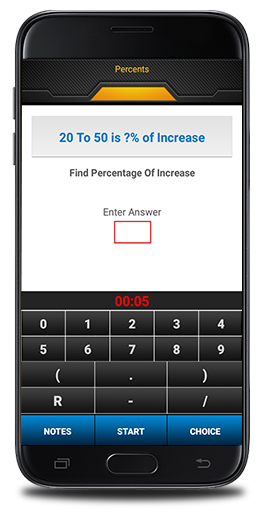 See how fast you can get 10 correct answers with a high percentage. The third format for the GAMES section requires interaction from you. Different games reflecting several math subjects are available for you to work with. The LEARNING and TRAINING sections at a minimum should be completed before working or playing these games as entering some answers need to be done correctly meaning the syntax for some answers require more than just numeric values. Read the information in the NOTES for more information. 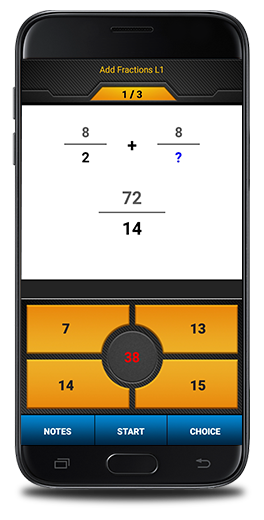 From the MULTIPLICATION math subject, here is a game for multiplying two digit numbers by 99 contains two parts. This SQUARES game is based on the first technique for squaring two digit numbers. The app has two methods, while the eBooks have several. 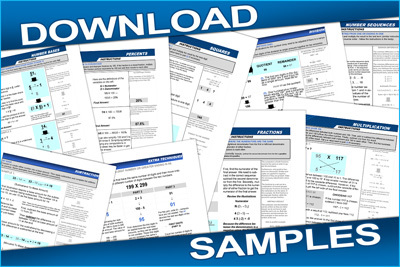 The Enter Various selection consists of different math subjects from basic math such as addition, subtraction, multiplication, and division to fractions, and beyond. Press the START button to begin the program. More than one input is required in these games. Generally, the answer is dependent on the expression right above it as represented by a red box; the red box indicates where to enter the answer for a particular part. Press the NOTES button for more information to learn how some answers are to be entered. After an answer for a part has been entered, the program randomly and automatically selects another part from a new problem. Some games with input have more keys than others due to having more math subjects that require certain keys besides the numeric values. Moreover, the timer counts up (increases) by a one second increment and is stopped when 10 correct answers have been achieved. The DUEL games are part of the overall GAMES section. The games in the DUEL part also comes in three formats: (i) 4 Multiple Choices, (ii) Yes/No, and (iii) Input. These math games allow two users to battle each other by testing their mental math abilities on various math subjects requiring many techniques in the process for solving the answers. Basically, the two users are on opposite ends of an Android smartphone, tablet or other compatible devices (such as a Kindle) running the Android operating system. You choose to either be the BLACK or RED team and your opponent on the other. One sample from each format is provided for your review. The BASICS of the DUEL section involves the four fundamental math subjects: addition, subtraction, multiplication, and division. This game is in the 4 Multiple Choices format. The SQUARES/CUBES of the DUEL section involves squaring and cubing numbers, and finding the square and cube roots of numbers. This game is in the Y/N format. The VARIOUS of the DUEL section involves several different math subjects from basic math to and including percentages. This game is in the INPUT format. Press the START button to start the program. 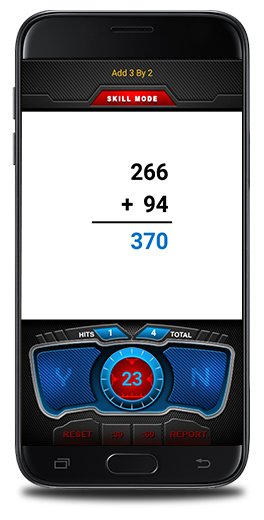 You are at one end of the android device while your opponent is on the other or opposite end. Math subjects are automatically generated for you and your opponent answer the problems as fast and as accurate as possible. Press the NOTES button for more information. 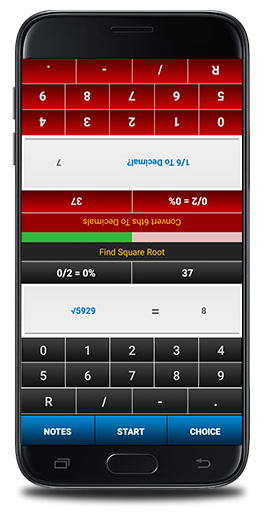 Depending on how the program generates the math problems, you and your opponent each may have different math problems but within the math subject(s) chosen. Pressing the CHOICE button gives different time restrictions ranging from 30 to 90 seconds. In terms of winning, there two ways to win read the information in the NOTES section. Moreover, note that there can also be no winner.